Is Saberi caught in the middle? Why was North Dakota native Roxana Saberi arrested in Iran? Ostensibly, it’s because she bought a bottle of wine, which is prohibited in the country. But maybe this picture offers a clue. Maybe it’s part of a power struggle inside Iran. 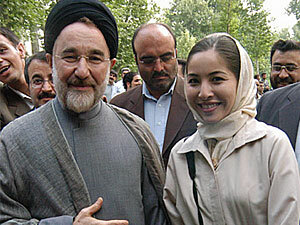 That’s a picture of Saberi with former President Mohammad Khatami. According to the New York Times “The Lede” blog, “Ms. Saberi’s arrest comes at a time of increasing pressure before presidential elections in June, during which at least two pro-reform candidates will be running against President Mahmoud Ahmadinejad. One of those candidates will be Mr. Khatami, whose reformist presidency preceded the conservative backlash that brought Mr. Ahmadinejad to power. It suggests that Saberi may be caught in a power struggle between conservatives and reformists in the country. Or it’s just Iran being Iran. She’s not the first female American journalist to get ensnared in the Iranian justice system. On her ABC News blog today, reporter Martha Raddatz recounted her own arrest in Iran. The police loaded us into a van and had two other police vans escorting us through the city. They took Bart’s camera, our press cards, and most disturbing, they took our passports. Raddatz says she hopes Saberi gets more help from her State Department than she did. Her family has hired a lawyer in Iran who hopes to see her tomorrow. Her father will be interviewed this afternoon on MPR’s All Things Considered. Update 4:59 p.m. – Here’s the extended interview. ‹ Older Are high school sports a luxury? Newer › End of the road for nuclear storage?